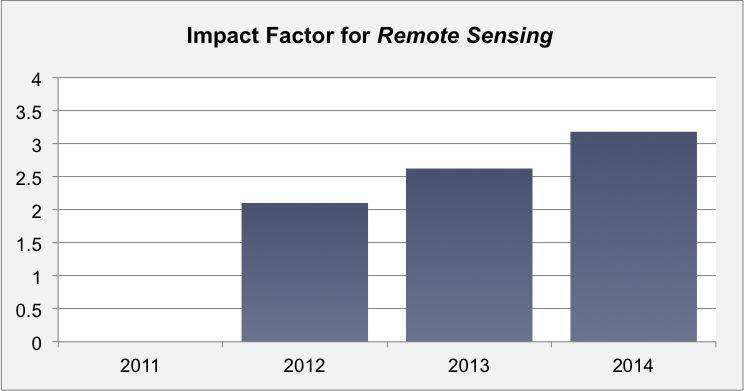 We are pleased to report the 2014 Impact Factor for Remote Sensing. According to the 2015 release of the Journal Citation Reports® Science Edition (published by Thomson Reuters in June 2015), the updated Impact Factor for Remote Sensing is 3.180. It has risen from 2.623 in the previous year (+21%), as illustrated in the figure below. The 5-Year Impact Factor is 3.257. Remote Sensing now ranks 5/28 (Q1) in the category ‘Remote Sensing’.